Welcome! I am an ecosystem ecologist at Dartmouth College interested in human influence on biogeochemical cycles in terrestrial systems. My emphasis is on understanding how climate change alters plant-soil interactions and the ecology, biodiversity and functioning of soils. My current research examines carbon and nitrogen cycling in the polar deserts of Antarctica and tundra ecosystems in western Greenland. I am also interested in the relationships between the disciplines of ecology, ecosystem science and environmental law. 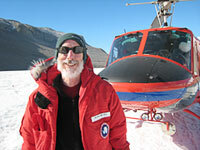 Currently, I am a co-principal investigator on the McMurdo Dry Valley Long Term Ecological Research Program. I also serve as the Director of the Dickey Center’s Institute of Arctic Studies and their NSF funded graduate program in polar environmental change – the Integrative Graduate Education and Research Traineeship (or IGERT). Through my role as Director, I also assist with the implementation of the Institute’s NSF funded Joint Education Science Program (or JSEP). JSEP is a program that provides high school students the opportunity to travel to polar regions and participate in hands-on and inquiry-based science activities. In 2014, I was selected by the U.S. State Department as one of two distinguished scholar leaders of the newly established Fulbright Arctic Initiative. This program aims to stimulate international scientific collaboration on the impact of climate change in the Arctic during the period of the U.S. Chairmanship of the Arctic Council, 2015-17.